Identification and prioritization of corridors for an implementable county-wide greenway network. 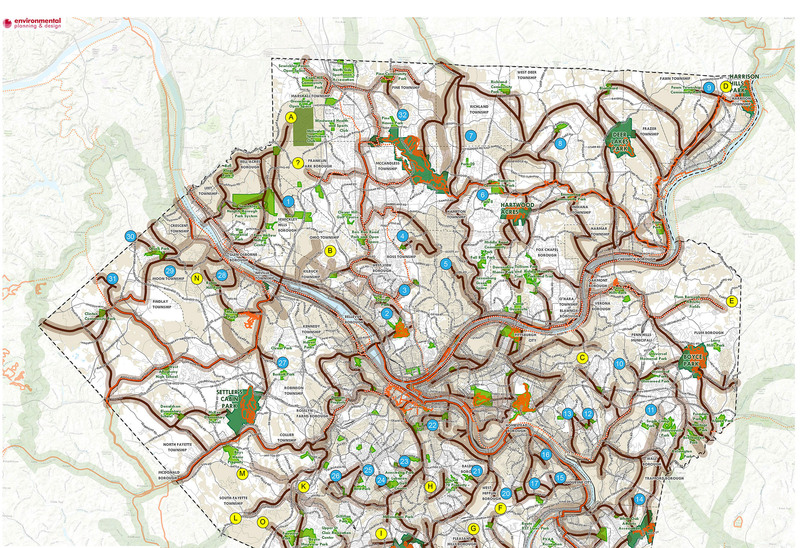 The Allegheny Green Web (AGW) project is a collaboration of more than 20 non-profit recreation, conservation, and environmental organizations working together to develop an updated greenway plan for Allegheny County. The focus of this initiative is on implementation and on connecting green spaces to populations that currently lack access or face environmental justice issues. Rather than simply increasingly connectivity between pristine greenspaces, the nodes of the network will consist of both “oases”—green spaces in the traditional sense, and “deserts”—areas that are need of connection to green space. The envisioned greenways will consist of conservation areas held by land trusts, vacant and underutilized land held by community land banks, agricultural working lands, and restoration opportunities such as acid mine lands, in addition to public lands. EPD is facilitating a data-driven approach to selecting greenway corridors that take into account the wide variety of benefits that greenways can provide, from recreation to habitat to green infrastructure. Services include the development of the conceptual framework, maintenance and collection of all GIS data, and the creation of a capacity analysis model that incorporates over 35 data inputs with adjusted weights separated into five categories: ecology, restoration, resilience, active transportation, and heritage. In addition to GIS analysis, EPD is also developing a browser-based interactive map that synthesizes the inputs and results of the analysis for communicating with diverse stakeholder groups.